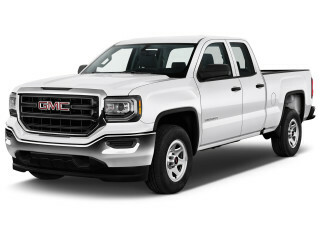 The GMC Sierra 1500 is a full-size pickup that's the dressier sibling to the Chevrolet Silverado 1500. The Sierra can be trimmed for work detail, but most will be near-luxury versions, including the Sierra Denali. With the Sierra 1500, GMC has an entrant on the half-ton pickup truck contest, but there are others. Competitors for GMC's Sierra 1500 include the Silverado, but also the Ford F-150, Ram 1500, Nissan Titan, and Toyota Tundra. Three-quarter ton Sierra 2500 HD and one-ton Sierra 3500 HD are available for heavy-duty shoppers and covered separately. 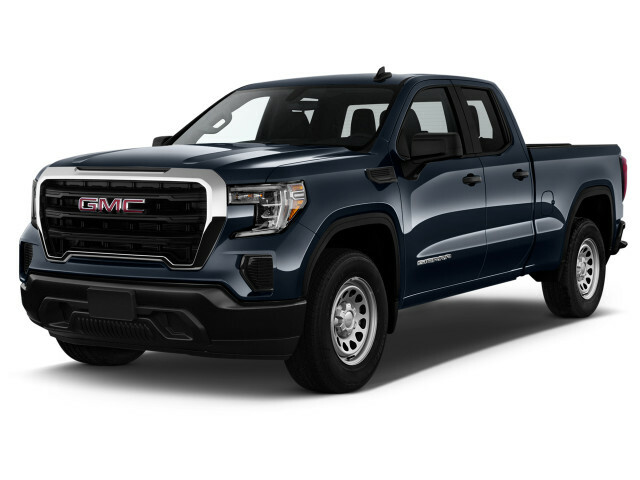 GMC unveiled the latest version of the Sierra 1500, its mainstay pickup, for the 2019 model year. With its latest edition, the GMC Sierra can't claim the strongest towing or payload capacity in its class, but it does offer a raft of cameras and technology that make those hauling tasks easier. Styling has been updated with a new, more forward grille and C-shaped taillights; LED lighting comes on pricey versions. Base trucks have a cabin with a big shield-shaped stack of controls, while upmarket models gain a wide center console, even metallic and open-pore wood trim in Denali editions. On sale in late 2018, the 2019 Sierra launches with two carryover engines, a muscular 355-horsepower 5.3-liter V-8 or a terrific 6.2-liter V-8 with 420 hp. The engines are coupled to 8- and 10-speed automatics respectively, and with either, straight-line performance is strong. The new Sierra balances its ride better than some full-size trucks, but can get jittery when shod with big 22-inch wheels, despite an available adaptive suspension. Future Sierra trucks will offer a base gas V-6, a turbodiesel inline-6, and a turbo-4 engine. In its most capable versions, the 2019 Sierra can tow up to 12,200 pounds and carry 2,240 pounds in its bed. 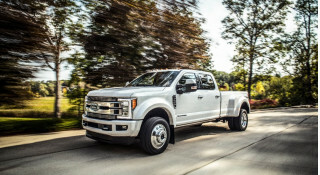 Those numbers are down and up, respectively; the Sierra's nearly a thousand pounds off the Ford F-150's maximum 13,200-pound tow rating. But the new Sierra does fix some of its bigger issues, namely, back-seat space. It's up by nearly 3 inches on four-door Crew Cab models. GMC also claims its bed is the best in the truck world, thanks to two features: an optional carbon-fiber bed claimed to be tougher and lighter than the bed in rivals, and a new two-piece tailgate that folds and swings into six positions that ease loading, payload access, and tailgating. No crash-test data has surfaced for the new Sierra, but it does offer a rear mirror camera and blind-spot monitors. Automatic emergency braking is only offered as an option on the most expensive models. Features range from vinyl floors on base trucks to Apple CarPlay and Android Auto, cooled front seats, and a trailer camera display that provides drivers with virtual eyeballs on payload and trailer hitches. 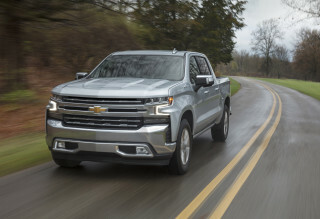 For 2014, both the Sierra and its sibling Chevy Silverado received new powertrains, nicer cabins, weightier styling, and a raft of new infotainment and safety features. Styling is refined and muscular on the new Sierra, but doesn't stray too far from previous designs, with a tall, blunt front end. The Sierra's cabin has a lovely, well-organized dash with big controls and high-quality materials, especially for a truck. GM offers three engines, all with direct injection, variable valve timing, and cylinder deactivation. 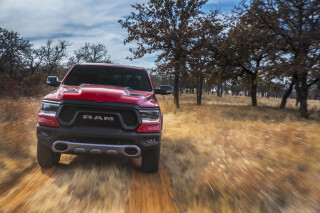 The base 4.3-liter V-6 performs admirably for most tasks, especially in fuel economy; the 5.3-liter V-8 makes 355 horsepower, and can handle almost any towing job up to 11,100 pounds. A 6.2-liter V-8 producing 420 hp and 460 lb-ft of torque is also available for dedicated fifth-wheeler. For 2015, GMC paired the bigger V-8 with a new 8-speed automatic, then added that transmission to higher-line versions of the 5.3-liter V-8 for 2016. The other transmission is a 6-speed automatic. All Sierra 1500 pickups use electric power steering, and get four-wheel disc brakes with long-life brake rotors. The ride is pretty smooth, and the available Magnetic Ride Control suspension—added for 2015—makes it even smoother. The steering is even better, with quick reflexes and just-right weight. Sierra Crew Cab models come with a choice of 5-foot-8 or 6-foot-6 beds, while regular-cab Sierra beds come in 6-foot-6 or 8-foot lengths. Extended-cab versions get only the mid-size bed; unlike in previous generations, the extended-cab model uses forward-hinged doors for better access to the second row. The rear doors can also be operated independently of the front openings, unlike with the old overlapped, rear-hinged design. Safety upgrades were included in the Sierra's 2014 redesign, including forward-collision alerts and hill-start assist. For 2016, GMC made IntelliBeam headlights and Lane Keep Assist available. Crash-test scores have been very good, with the NHTSA awarding five stars overall. Base Sierra equipment includes air conditioning, keyless entry, and an AM/FM radio with a 4.2-inch color display (the latter for all but the base regular cab). GMC’s IntelliLink connectivity system is optional on the Sierra; it combines full voice-command functionality with Bluetooth phone, Bluetooth audio streaming, a Pandora app, and available navigation with an 8.0-inch touchscreen. A version of IntelliLink with a new 7.0-inch touchscreen comes standard in the new Elevation Edition, a low-end model with some features most truck buyers would want. Special models are decked out with other features—off-road suspension and gear in the Sierra All-Terrain, while the Sierra Denali and the new Sierra Denali Ultimate get extra luxury touches, a standard V-8 engine, and the Magnetic Ride Control suspension. Changes for the 2015 model year were few, but included the addition of an optional 4G LTE system. It can turn the Sierra into a wi-fi hotspot for mobile devices and also speeds up the connection for OnStar services like driving directions that get sent to the vehicle from a live operator as well as diagnostics. For 2016, GMC has updated the front end of its Sierra. Each model gets a bolder version of its unique grille, and all models add some form of LED lighting. Base, SLE and SLT models come with projector beam headlights with LED signature lighting, while high-performance LED headlights are standard on the Denali and available on the SLT. The SLT, All-Terrain, and Denali also have LED fog lights and taillights. The Denali Ultimate adds special 22-inch chrome or black-insert wheels. A locking tailgate is also newly available, and so are power steps for the Denali models. These steps automatically move in and out and can move forward and back by kicking a button at the rearmost end of each step. A mild-hybrid version that allows for some low-speed electric-only driving is also on offer. Other 2016 changes included the addition of wireless charging for models with the front bucket seats, a faster processor for the infotainment system, and the addition of Apple CarPlay and Android Auto compatibility. For 2017, the Sierra's big news was the availability of a low-speed automatic emergency braking system—a rarity among pickups. For 2018, the Sierra received a standard rearview camera and offered a mild-hybrid powertrain. The Sierra nameplate was first used in 1999, when General Motors switched the old C/K pickup trucks to a new architecture and a new body style. With slightly rounded sheet metal, the Sierra presented truck buyers with an alternative to the wildly successful Ford F-150, which had adopted aerodynamic styling in 1997. The Sierra's interior didn't change as much, though, and while it was spacious, it seemed lower-grade than the comparable Ford cabin. With extended- and crew-cab versions, short- and long-bed editions, and a choice of V-6 and V-8 powertrains that mated with manual and automatic transmissions, the rear- or four-wheel-drive Sierra offered something for nearly every truck shopper. The luxury Denali edition arrived in 2002, and four-wheel steering (GMC called it Quadrasteer) became a short-lived option. In 2003, the Sierra got a mild restyling; and in 2005 a mild hybrid edition arrived, with the ability to recapture some energy and charge batteries that aided the drivetrain and powered onboard accessories. For the 2007 model year, GM began rolling out its GMT900 generation of trucks and SUVs—fully redesigned models with new body styles, new powertrains, and new technology. The Sierra 1500 emerged from this renovation with a conservative but tasteful exterior, and a very attractive, very high-quality interior to match its improved drivetrains. Engines ranged from a 4.3-liter V-6 with 195 hp to a 6.2-liter V-8 with 403 hp—the latter essentially derived from the Corvette's V-8. Four- and 6-speed automatics helped increase fuel economy on most versions. The real gas-mileage boost came with the introduction of the 2009 Sierra Hybrid, which teamed a V-8 with batteries and motors and a two-mode transmission for fuel economy of 21/22 mpg. It was discontinued after the 2013 model year. From 2010 to 2013, the GMC Sierra saw only minor changes, with new engine braking for 2013 (in 6-speed-automatic models) one of the most significant improvements. So far destructs been a very good funny strong truck. Not impressed we purchased a 2017 Gmc elevation the very next morning the truck wouldn't start! Morning two truck doesn't start. Dealer replaces battery. Next morning truck doesn't start!